Moscow’s underground mosques: Russia’s intolerance toward Muslims may be breeding a more radical brand of Islam. 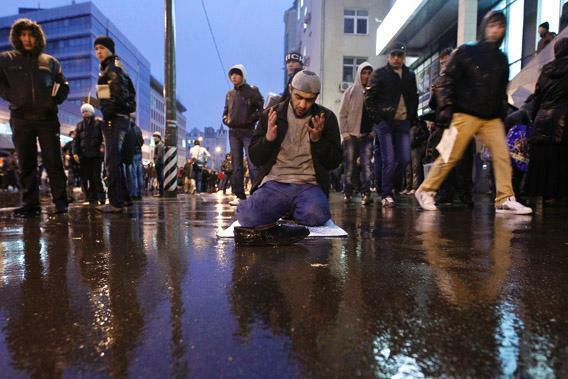 Moscow’s intolerance is forcing Russian Muslims to take shelter. Is the city breeding a more radical brand of Islam? Muslims pray to celebrate Eid al-Fitr, marking the end of Ramadan, in Moscow Aug. 19, 2012. MOSCOW—Because the Islamic calendar is about 10 days shorter than the Western one, the sacrificial slaughter of rams during the Muslim holiday of Kurban Bayram often catches the residents of Moscow by surprise. Last year it happened in October. The year before that it was in November. In 2006, nobody paid much attention to the ritual because it coincided with New Year’s Eve. But on most years, Muscovites only realize that it’s Kurban Bayram when state TV plays footage of horned beasts being sold out of trucks and sliced open in the streets. Or, on rare but highly publicized occasions, when unsuspecting residents find pools of ram blood in their parking lot or in the sandbox of their local playground after Kurban Bayram. The city then spends the next few days in fits of xenophobia and existential woe. Inevitably they move on, forget about their Muslim neighbors for a while, and worry about something else. But for those days they hate them, openly and with foul words. The local government does not do much to ease that enmity, and in some ways official policy exacerbates it. 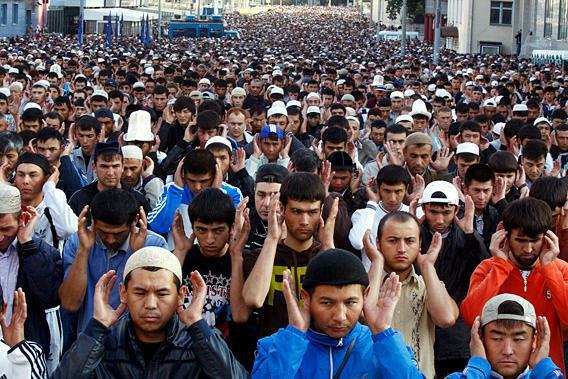 Moscow has 2 million Muslim residents and up to 2 million more Muslim migrant workers. Because of what amounts to state discrimination, the city has permitted the existence of only four mosques, none of which can fit more than 10,000 people. (The Russian Orthodox Church, which has 650 places of worship in Moscow alone, is meanwhile pushing ahead with a government plan to build 200 more churches across the city in what is known as the “Church a Step Away” program.) Nowhere in Moscow is the Muslim call to prayer allowed to disturb the non-Muslim population, so there is no chance that the city will provide public facilities for the Islamic faithful to perform animal sacrifice. The Muslims of Moscow are forced to practice their religion in the open air, which makes for awkward times. In the past week, the latent tensions started to erupt once again, sparked this time by a man from the predominantly Muslim region of Dagestan who cracked open the skull of a police officer at a Moscow bazaar on July 27. (Footage of the attack has gotten close to a million views on YouTube.) Police have responded with raids to “decriminalize” outdoor markets across the city, arresting around 3,000 migrant workers, many of them Muslims. A makeshift internment camp of tents and port-o-potties was even set up in the north of the Russian capital to house all of the detainees. Neo-Nazi groups in St. Petersburg have meanwhile taken the police raids as an excuse to launch their own attacks, using baseball bats to smash the fruit stands of migrant workers. They promise to do the same in Moscow. Like most parts of the Russian heartland, Moscow has for years been particularly inhospitable for Salafism, a fundamentalist brand of Islam that wants to see the caliphates of the Middle Ages restored and sharia law adopted. It is the fastest-growing movement within the fastest-growing religion in the world. So Moscow’s problems are not entirely unique. Similar tensions were evident in Switzerland in 2009 when a national referendum banned minarets in circumvention of the Swiss constitution. Those tensions came to life in New York City in 2011 during the loud scrap over Park 51, the Islamic community center near Ground Zero. Civic clashes like these are going on in many places where Muslims and non-Muslims live side by side. The problems mostly stem from the fact that the mosque is far too small, and on Kurban Bayram and other holidays, worshippers swarm the surrounding neighborhood by the hundreds of thousands. A heavy rain had fallen on a recent Friday when I went there to hear the service, and because of the lack of space people were forced to lay down prayer rugs on the wet asphalt, many over puddles. (In the winter they do this in the snow, ice, and slush, shivering as they bow toward Mecca.) The police presence was heavy that Friday, with two full trucks of riot troops parked at the curb. 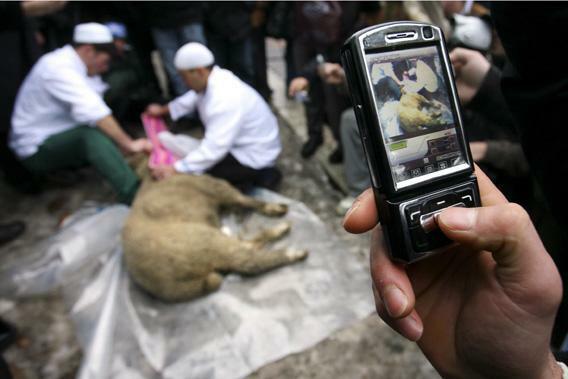 Moscow Muslims slaughtering a sheep to mark the feast of Eid al-Adha (Kurban-Bayram). On Fridays, thousands of Salafis descend on the underground mosques of Moscow, one of the biggest of which is called Darul Arkam. It is a single-story building, about the size of a one-bedroom house, that stands in the middle of a grimy industrial neighborhood surrounded by junkyards, auto-repair shops, and clusters of rusty sheet-metal garages. The mosque is blocked from the street with a bare concrete wall crowned with barbed wire, and the only way in or out is through a narrow metal door. There are no signs outside to distinguish it from the surrounding lots, no minarets or crescent moons. An outsider would have trouble finding it even with the address marked off on a map. About half of the congregants wore the facial hair typical of Salafis, who like to trim their mustaches close but let their beards grow long, sort of like the Amish. They started to gather around noon, just as a group of volunteers began inflating the large white tent in the courtyard to accommodate the growing crowd. The tent’s scuffed white exterior was badly in need of a wash, and its wooden floor was lined with simple woven plastic prayer rugs. Just beside it a kind of field kitchen had been set up, where volunteers prepared a vat of steaming plov, the staple dish of rice and meat served in every Muslim part of the former Soviet Union. He was referring to an incident on April 26 when several busloads of Russian troops raided Darul Arkam. For hours, they kept a couple thousand worshippers inside the mosque and its courtyard as police checked everyone’s documents. According to a statement released by the FSB (the agency formerly known as the KGB), 140 of the congregants were arrested on suspicion of involvement in radical Islamist groups. Among the mosque’s past congregants, the FSB said, were four men convicted of attempting to bomb a passenger train between Moscow and St. Petersburg in July 2011. (The FSB found and defused that bomb before it was detonated, and the alleged perpetrators are now serving sentences of between 15 and 18 years.) After the raid on Darul Arkam, state-run television channels and news agencies ran reports claiming that a group of “Islamic extremists” had been apprehended in Moscow. For the head of the mosque, a young imam named Mukhammad-Basyr Gasanov, the press coverage of the raid was the most painful part. “It was Islamophobia, which is a political trump card in Russia,” he told me. “We have no way of fighting it.” So the mosque closed down for a couple of weeks after the raid, while its leaders sought guarantees of protection. That meant reaching out to the Council of Muftis, the state sanctioned organization meant to represent all of Russia’s Muslims. Marking the first day of the Muslim holiday of Kurban Bairam (Eid al-Adha) in Moscow in 2012. The Council of Muftis does not, however, represent the Salafis. The council adheres to a brand of Islam called Sufism, whose strict hierarchy makes them convenient partners for the state, but not for other sects of Islam. The council’s chairman, Sheikh Ravil Gaynutdin, regularly meets President Vladimir Putin to discuss the interests of Russian Muslims and, like all Sufi leaders, emphasizes the importance of clerics and imams in guiding the religion, purporting to serve as its embodiment on earth. Although the analogy is far from perfect, Sufis are closer to Catholics in this respect, at least in that they have a clergy that claims to represent the faith. By contrast, the Salafis are somewhat like Protestants: They renounce this sort of mediation and call for a direct relationship between the faithful and their God, untainted by the views of clerics. (Especially abhorrent to Salafis is the Sufi practice of praying at the graves of Sufi holy men and mystics, a ritual Salafis find idolatrous.) Whatever the theological implications, in modern-day Russia, it means that Sufis are, in a way, more easily controlled by the state through their leadership. In order to ensure that the raid on his mosque would not be repeated, Gasanov needed the Council of Muftis to vouch for him. “We needed to guarantee the safety of our congregants,” he told me. This was a delicate game. In exchange for protection, the Council of Muftis tends to demand loyalty, and if a mosque like Darul Arkam does not want to integrate into the official structure, it is left in a legal grey zone at the mercy of Russian police and security services. But that would be like asking a group of evangelicals to pledge allegiance to the pope, register with the Vatican, and accept a Catholic priest as leader of their congregation. Needless to say, this is unacceptable to the Salafis, as are some of the sermons that can be heard at Moscow’s few official mosques, all of which are Sufi. But regardless of how the negotiations end, this form of religious arm-twisting can have only one consequence for Russia’s Salafis. They will go deeper underground. If their mosque bends to the demands of the Council of Muftis, many of its congregants will find another place to worship, most likely someplace smaller, further out of sight of the authorities and closer to the reach of radical clerics who preach in the city’s hidden prayer rooms. If Darul Arkam refuses to yield, the police harassment will likely continue until the mosque is forced to close. “We are in a very precarious position,” says Gasanov, its imam. After the raid, he expected his congregants to get scared and go elsewhere. But they didn’t. “It is a joy to see,” he told me, looking over at the pile of shoes in the entryway. “Our numbers are back to what they were before the incident… two to three thousand for the Friday prayers.” Outside, the young men were busy meditating after the service had ended, or standing in line for a plastic bowl of plov.